Life after retirement is very boring. This is what ignorant people used to say. As if they are lived to work. Once they stop working, they start waiting for death. It's really ridiculous. I started my blogging life after retirement. I enjoy blogging and updating my knowledge through blogging. It's so coincidentally that the former Prime Minister of Malaysia Tun Dr. Mahathir Mohamad is also a blogger. It seems that life is full of fun even after retirement. 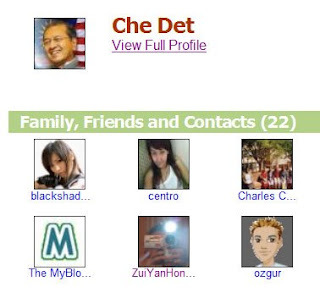 Recentlly, Tun Dr. Mahathir Mohamad became a member of my blog community at social network website--Mybloglog. I had never expected that this would happen even in my dream. Tun Dr. Mahathir Mohamad was the fourth Prime Minister of Malaysia. It's no need for me to write about him because you can visit his blog to read his articles. The only thing that I want to mention here is regarding his childhood as a banana fritter seller. Based on a Chinese text book of Chinese Primary School, Tun Dr. Mahathir Mohamad sold banana fritter to earn his pocket money when he was a boy. I always encourage my students to work hard as Tun Dr. Mahathir Mohamad and not to give up easily. It seems your blog is too powerful now. Thank you for your comment and it's ok to exchange links. Yup! Blogging is so much fun! Prime Land For Sale In Muar, Johor.